April snow showers bringing spring flowers? Once again winter does not want to give up. There’s another band of polar air hitting the northern US this week. However, as the sun increases every day, spring is beginning to show. Subsequently, this is will be the last forecast until next season. This weekend the Midwest had two significant snow storms. On Sunday, snow started to fall in eastern South Dakota and worked its way east, dumping over 8 inches in Minnesota and Wisconsin. Conditions are more spring-like in the Northeast, with rain over the week causing depleting snows depths. For April, trails are looking great. 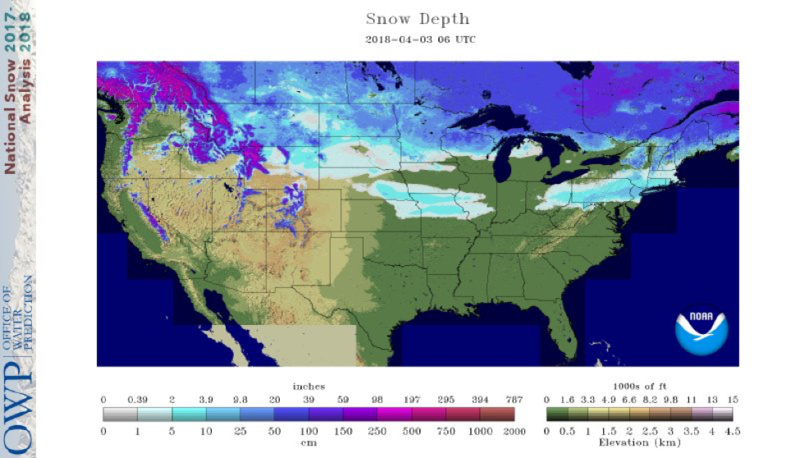 The Northern Plains and Montana still has a decent snow depth. Any future snowfall will most likely be heavy wet snow with snow melt during the day with the increase in sunshine duration. The Northeast took a toll with the heavy rains. Your best bet is to find higher elevations. This time of year, be aware of closed trails. 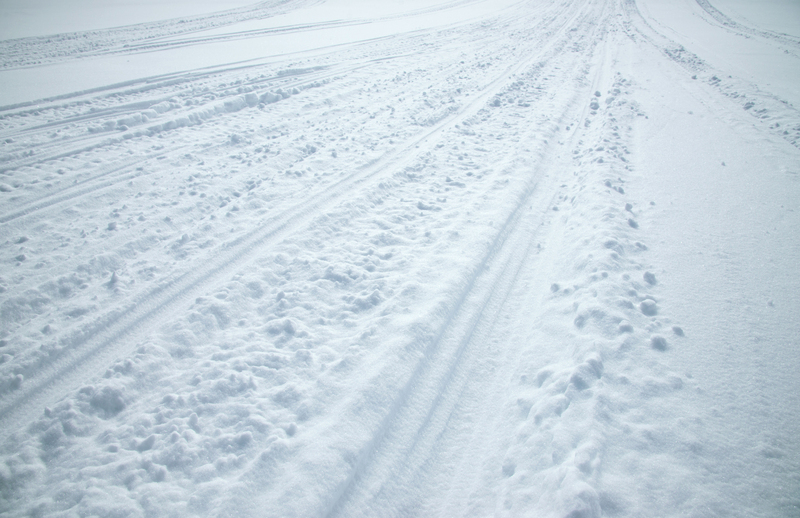 Check your local trail conditions before going out. The cold air will persist on through this week. A Canadian high block allows winds from the north bringing in polar air once again. Temperatures for the Northern US are below average with 15-30 degree deficit. Starting in the West, a robust wave of moist air coming from the pacific will bring heavy rains for the coast line. As the moist air moves inland, the Rockies are looking to get a strong bath of snow starting late today and into the weekend. The Midwest looking for more snow this week. The cold air will allow for light snow showers during the week. Then, late this weekend, moist air from the Pacific could provide for some significant snow fall once again on Sunday/Monday. Another clipper will pass through the Northeast this Friday/Saturday. The cold air may be enough to see snow in the higher elevations for one last riding. Take advantage of any snowfall! 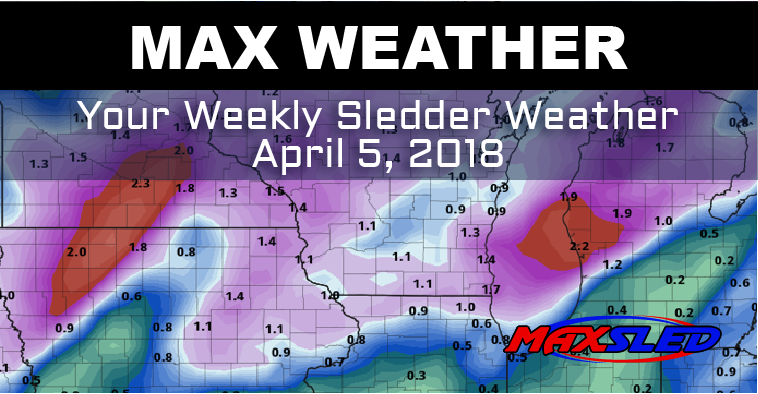 Spring is just right around the corner and with that, this is my last forecast. Enjoy your summer months, I’ll see you out on the trails next year.